Kuala Lumpur is known for parks, shopping, museums, historic sites, and zoos & aquariums. 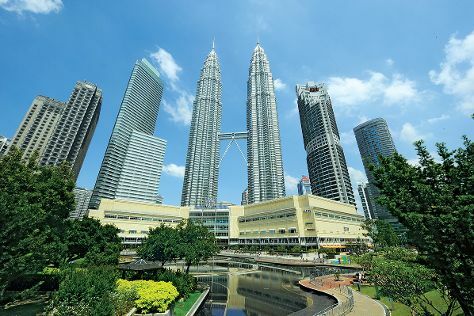 Your plan includes some of its best attractions: admire the landmark architecture of Petronas Twin Towers, Head underground at Batu Caves, browse the different shops at Central Market Kuala Lumpur, and look for all kinds of wild species at KL Bird Park. For ratings, reviews, other places to visit, and tourist information, read our Kuala Lumpur tour planning site . Chandigarh, India to Kuala Lumpur is an approximately 13-hour flight. You can also drive. The time zone changes from India Standard Time to Malaysia Time, which is usually a 2 hour difference. In May, plan for daily highs up to 39°C, and evening lows to 28°C. Cap off your sightseeing on the 7th (Tue) early enough to travel to Amritsar. Kick off your visit on the 8th (Wed): let your taste buds guide you at a local gastronomic tour, tour the pleasant surroundings at Jallianwala Bagh, then contemplate in the serene atmosphere at Gurudwara Baba Atal Rai, and finally contemplate the long history of Gurdwara Bibeksar Sahib. Here are some ideas for day two: admire the landmark architecture of Akal Takht, then appreciate the history behind Serai Amanat Khan, then contemplate in the serene atmosphere at Gurudwara Shri Janam Asthaan Shri Guru Amardas JI, and finally relax and rejuvenate at some of the best spas. To see reviews, maps, traveler tips, and more tourist information, use the Amritsar trip site . Fly from Kuala Lumpur to Amritsar in 8.5 hours. Alternatively, you can drive. Due to the time zone difference, you'll gain 2 hours traveling from Kuala Lumpur to Amritsar. When traveling from Kuala Lumpur in May, plan for a bit warmer days and about the same nights in Amritsar: temperatures range from 46°C by day to 26°C at night. Finish your sightseeing early on the 9th (Thu) so you can drive back home.